Plot: Maharaj Ashvapati and his wife, Malvi, are childless. They pray to Devi Maa Gayatri, who appears before them, but tells them to their dismay that they cannot sire a son. She does appease them by blessing them with a daughter. Shortly thereafter a daughter is born and is named Savitri, by none other than Devrishi Narad. When Savitri matures, she receives many proposals for marriage, but decides to wed a poor woodcutter, Satyavan, who saved from being attacked by a tiger, and who lives a poor lifestyle in a Rishi-Ashram along with blind parents, who were once Raja and Maharani, but their kingdom was taken away by deceit by the Raja's brother. 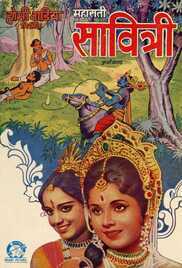 Despite objections from her parents, Savitri and Satyavan wed, and Savitri goes to live a simple lifestyle. She undertakes the Akhand Saubhagyawati Vrath, but shortly thereafter Satyavan passes away after being bitten by a snake. Yamraj sends his Dhoots to bring in Satyavan's soul, but they are prevented by Savitri. Yamraj himself undertakes this task, and after successfully deceiving Savitri, claims Satyavan's soul and takes it with him. Upset at Yamraj, Savitri decides to follow him, with assistance from Devi Maa Gayatri, all the way from Prithvilok, then to Devlok, then to Swarg, and it is finally at Brahmlok that she will be told that no mortal can enter this realm, and is asked to leave, but not before Yamraj agrees to grant her three wishes - none of these could be utilized to bring back her deceased husband. The question remains: what will Savitri wish for?